In early June 2011, I visited the far north Territory of Nunavut, Canada for the first time. Nunavut became a separate Territory from the Northwest Territories April 1, 1999. It is the largest of the Provinces and Territories in Canada with the smallest population at about 28,000. Nunvut consists of 1,932,255 km2 (746,048 sq mi) of land and 160,935 km2 (62,137 sq mi) of water in Northern Canada. I had been to Whitehorse in the Yukon and Yellowknife in the Northwest Territories before and wanted to see and get a sense of this vast northern place. I was there in the capital city of Iqaluit, at the invitation of the Canadian Bar Association's Nunavut Branch to present a seminar on Mediation over two days. My other goal for the visit was to fish for Arctic Char which are plentiful. Arctic Char are a form of trout (some say salmon) which are absolutely delicious and they are known as a fighting sport fish which I have always wanted to catch. This trip appeared to present a great fishing opportunity. The City of Iqaluit in Nunavut is the smallest capital city in Canada with a population of about 7,000, few paved roads and no traffic lights. It is on Frobisher Bay which is part of the Arctic Ocean. Before it was called Iqaluit it was called Frobisher Bay named after the explorer Martin Frobisher who discovered it in 1576 while searching for the Northwest passage. The town was a US military base that was the staging point for the cold war defence system known as the Dew Line. The local airport has a huge landing strip originally built for the U.S. military. Back then Inuit were not allowed to live in the Town for security reasons and lived in an area called Apex which is now part of the City of Iqaluit. Iqaluit is the now the capital of a territory set up for the Inuit people and it is the home of the least partisan government in the country. The Legislature sits in a circle with no party system. The Cabinet is the Government and those members of the Legislature outside of Cabinet are equivalent to the Opposition. Policy is presented by Cabinet and the slight majority of members outside of Cabinet have the power to vote it down if united but it appears most of what the Government does is by consensus. The culture of Nunavut is mostly Inuit and there is much federal assistance to allow this still new Territory and new City to function and develop. Inuit art is impressive both in the form of sculpture and drawings. The art is famous across the world especially from the artist community of Cape Dorset southwest of Iqaluit. There is much encouragement in Nunavut of traditional Inuit life in the modern world which includes art, the controversial seal hunt which continues,traditional foods, clothing, language and building structures (many modeled after the traditional igloo). The Inuit are adjusting to modern urban life with difficulty in Iqaluit. Social services development is a high priority. There are no liquor stores for a reason. When I visited there had just been a tragic family murder suicide which sadly put Nunavut in the national news again in a negative light. Nunavut's reputation has been harmed by media coverage of its high suicide and crime rates but the people are very friendly and I felt very safe. Much of the crime and social problems are alcohol related and it tends to be within families. 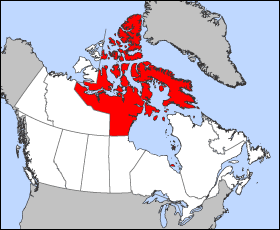 Many of the professionals working in Nunavut come from southern Canada. There are not enough of them to do the work and there are not enough Inuit with the skills needed for the modern world. Many people come to Iqaluit to work for higher than average wages on a temporary basis. There are great opportunities for Inuit but it will take time for them to get the necessary education to improve their conditions. Iqaluit is just a tiny part of a vast territory in a very big country. I enjoyed visiting Iqaluit and hope that you will go sometime and see for yourself what it is like. When I was there the ice and snow had not yet left the Bay and River and I was unable to access the water to fish for Arctic Char. I bought some frozen smoked Arctic Char to take home and it is excellent. I will definitely return some time when summer conditions are there to fish. It was light outside virtually 24 hours of the day and I will definitely return in the winter when I will be able to see the Aurora Borealis (Northern Lights). Yes, Canada is a very big country and Canadians should try to see as much of it as they can. Nunavut is the biggest part of Canada and I am honoured to have gone there, if only for a brief visit.